Natural stone is one of the few materials that contains no pollutants and does not release substances during fires that could damage your health. This material also doesn’t require chemical substances such as protective coatings before it can be used. After natural stone is quarried from large blocks, it is then cut into desired sizes by fabricators based on the requirements of the project. Natural stone can also be cut into more shapes than just squares and rectangles. The different varieties of stones can allow you to highlight the uniqueness in your project. There are some building materials that don’t take well to time and the elements, but not natural stone. The life of natural stone is extremely long and with the right planning, natural stone buildings have been known to survive for thousands of years. Natural stone has been proven to be no more expensive than synthetic building materials. The high investment costs of natural stone is offset by the low-maintenance costs. Natural stone is one of the most durable materials on the market. This allows your family to use the kitchen, bathroom or any other areas in your home without concern of damaging your stones. Even after years of use, most natural stones show hardly any signs of wear and tear. There are a wide range of finishes that can be applied to natural stone to extend it’s life, resist wear and tear, and make stone slip resistant. Most natural stones only need to be washed with mild soap and water. If you are skeptical about using soap, there are cleaners that are specifically made for natural stone that are affordable. No matter where you go on earth you can find beautiful natural stone. Its diversity is unparalleled to other building materials. Don’t let anyone tell you natural stone is not worth it! Natural stone is used in homes across the world and it’s not going anywhere soon. It is one of the most vertisle materials in the world. You can use natural stone for countertops, floors, bathrooms, showers and kitchen backsplashes. 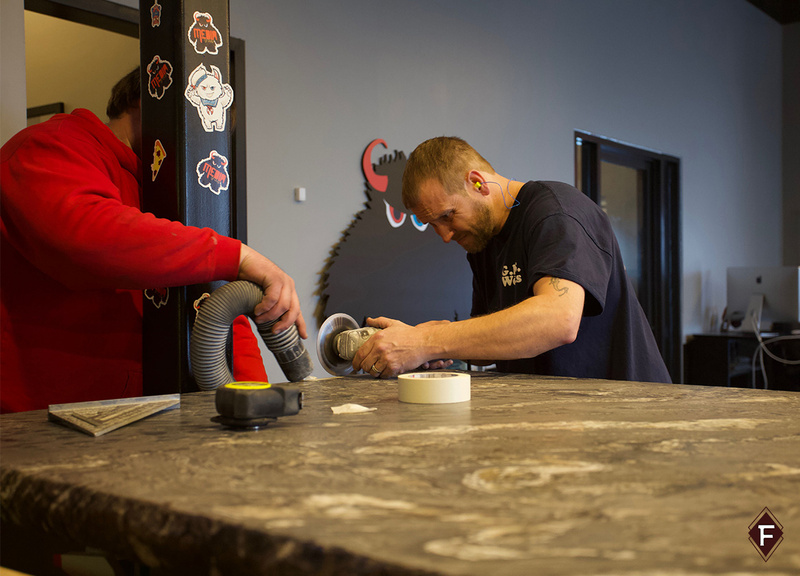 Picking out the right countertop for your home is just as important as finding the perfect wedding dress for your special day. It can make or break the aesthetic of your home. Especially if you are planning on putting your home up for sale in the future. You want something that will help sell your home and still keep it modern and stylish. With the ever-changing kitchen trends heating up it can be challenging to keep up with all the trends. One thing for sure is that stone material in kitchens are always a win! Here are some of the hottest trends that left their mark on 2018 kitchen countertop trends.